Think about the tax preparation processes you have in place within your firm. Do they work? Do they create value? 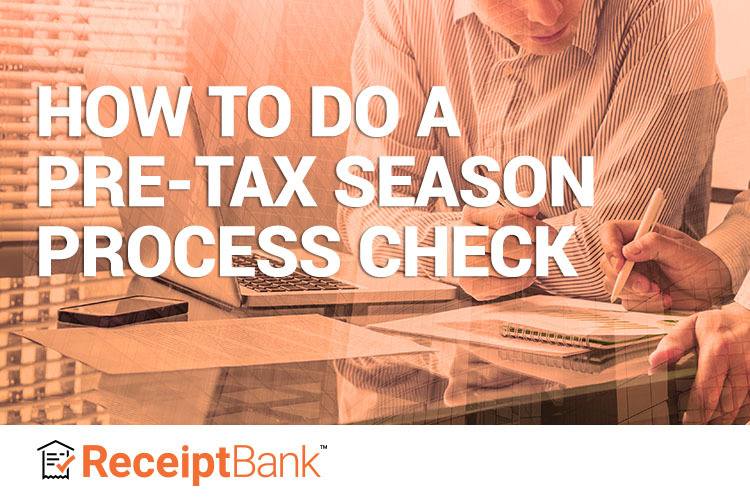 Prepare for the upcoming Tax Season by doing a pre-tax season process check to ensure that you are ready for the change in workload. If you aren’t quite sure where to start, follow these three key steps to assessing your processes. How many steps does the process have? Which business functions or team members are involved? What is the impact on the total cost and quality of the process? What opportunities exist to improve? The answers to these questions will help you decide where you can improve the process and where new technology can be of assistance. Bookkeeping is a classic example of a time-losing process within a practice. It’s a multi-stage process where each step can involve multiple people, which offers many opportunities for bottlenecks and inefficiencies. However, it’s also a process that can be improved greatly with the introduction of new tools. 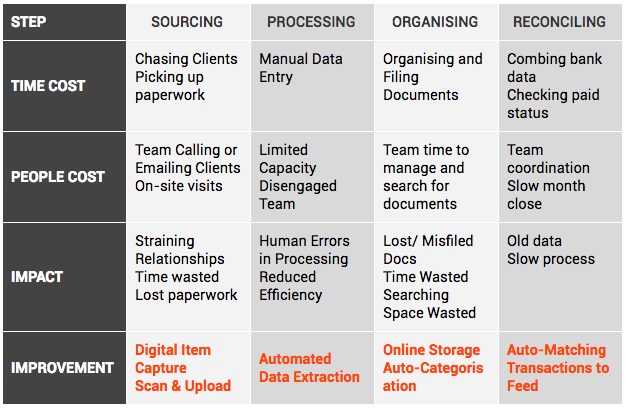 In the table below we can see the effect these steps have on your team, as well as how they can be improved with a tool like Receipt Bank. As you can see, small changes can make for a big change in your efficiency and productivity. Don’t let a pre-tax season process check intimidate you. Use it to your advantage as an opportunity to evolve your processes with technology. With a few changes, you’ll be able to boost your firm’s efficiency by performing internal audits, standardizing your processes for all clients, and effectively handling any last minute items. Audit your clients: Is everyone using the app? If not, do they still need to download it? Use our SMS invite feature to get Receipt Bank in the hands of all your clients. Take advantage of different client types: Move any self-employed clients to Receipt Bank Self Employed so that their expenses are auto-categorized onto the form Schedule C.
Clear out your inbox: Set the customizable email-in address and set up recurring suppliers on Invoice Fetch. Perform an automation audit: Aim to have a certain percentage of client submissions automated by setting Supplier Rules and using Auto-Publish. Clear out your backlog: Apply bulk coding to like items and Boost last minute submissions for quicker processing. Give yourself peace of mind: Don’t worry about duplicates with Paperwork Match. Hold your clients accountable: Send an Outstanding Paperwork report to clients every Friday and track submission KPIs. Simplify communications: Keep all activity within Receipt Bank by using Item Messaging so that you don’t get lost in your client’s email inbox. Plan for success: Set goals and incentivize your team based on metrics within Practice View. Learn more about how to have your most efficient and profitable busy season yet!